The 2nd World Conference “Strategies towards more sustainable food systems in the Mediterranean Region: Mediterranean Diet as a Lever for Bridging Consumption and Production, in a Sustainable and Healthy Way”, will take place in Palermo (Italy) from the 15 to 17 May 2019. Organised by CIHEAM Bari and by the Forum of the Mediterranean Food Cultures in collaboration with more than 20 partners, this world conference will be hosted under the auspices of CIHEAM, the International Foundation of Mediterranean Diet (IFMeD), the Union for the Mediterranean (UfM) , the Italian Ministry of Foreign Affairs and the International Cooperation, the Region of Sicily, the City of Palermo, and the European Federation of Nutrition Societies. This high-level meeting will aim to better identify strategies, programs and actions, able to provide solutions for coping with current critical challenges in the region through more sustainable Mediterranean food systems, by bridging sustainable food consumption and production through the Mediterranean diet as a lever. 18 thematic sessions, articulated in three days and in four historical locations in the heart of Palermo, will dialogue all together as an open discussion forum on most appropriate conceptual frameworks and methodological approaches to improve sustainability of food consumption and production in Mediterranean countries by using the Mediterranean diet as a healthy and sustainable lever. 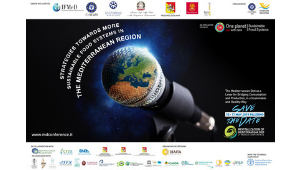 All thematic sessions will contribute to the development of the Conference Call that will be issued at its conclusion, as The 2019 Palermo Call for a Common Action in the Mediterranean Towards More Mediterranean Sustainable Food Systems: CHANGE OF ROUTE: A Transformational Change in the Region. It will be issued in the context of the preparatory process of the 5+5 Dialogue Summit of the Two Shores, that will be held on 24 June 2019, in Marseilles. Its Organizing Secretariat is DIAITA and the UN-FAO will provide technical support.